Today slideshow presentations are the essential part of school lectures, business speeches and church services but not all of them use engaging visuals to make an impact and grab the viewer’s attention. Try to remember how many times you had to sit through frustrating slides packed with dense text and cheesy transitions that did a poor job delivering new information. If you’re sick and tired of templates with endless bullet points and want to share your ideas in a more creative manner, you should test the slide presentation programs from the list below. Here we’ve compared top 10 programs for making photo presentations and shared our thoughts on their pros and cons. Keep on reading this post and you’ll learn what features make presentation software really cool and what program you should choose for different types of speaking engagement. What Makes Great Slideshow Presentation Software? ✔ Easy-to-use: Even users who aren’t tech savvy should be able to handle software and learn to use it on the go. ✔ Ready-to-go: With proper software, you won’t have to create a presentation from scratch especially when you need to make a decent project in just a few minutes - it should offer you a large number of templates, images and other media. ✔ Shareable: For the needs of collective work, you should be able to share presentations with other users and edit them simultaneously. ✔ Cost-effective: It’s always better to find software with sufficient functionality where you won’t have to overpay for the features you don’t even use. Eager to know what slide presentation software meets all these expectations or at least most of them? We’re about to introduce the most promising candidates. 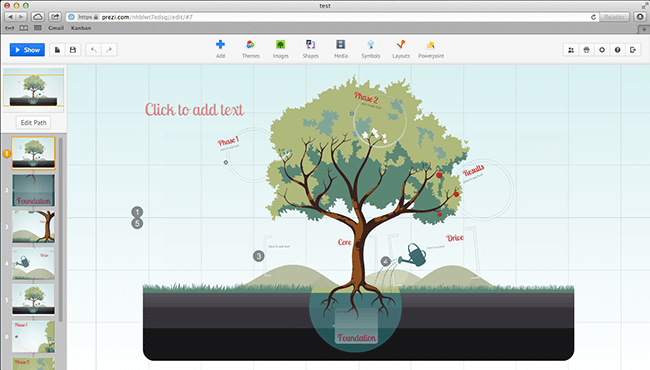 This web-based tool will be an ideal choice for those tired of standard slideshows made in PowerPoint or Keynote. Prezi lets you create heavily animated and non-linear presentations in the form of a mindmap with your points and graphics nested inside. While you’re giving speech, your Prezi-driven presentation will zoom in to focus on some particular details to accompany your story, then zoom out and back into a different point as you move on. Adobe Spark deserves credit for being simple as ABC and yet providing more creative options than traditional PowerPoint. Just the same as Prezi, this presentation creator can be used right on the official website, so you don’t have to download and install anything. 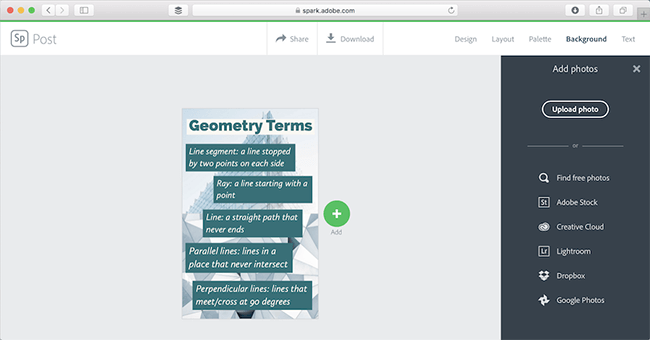 All in all, Adobe Spark allows you to create web stories and animated videos that can serve as seamless presentations running without your constant control. Modern presentations are no longer separate slides you click through one at a time. With SmartSHOW 3D, you’ll be able to make an animated video that can auto-play during your whole speech. This slideshow presentation program offers you lots or pre-designed templates, animation presets, a collection of different backgrounds, a virtual camera to move over the slide, ready-made text styles, and places much more tools right at your fingertips. 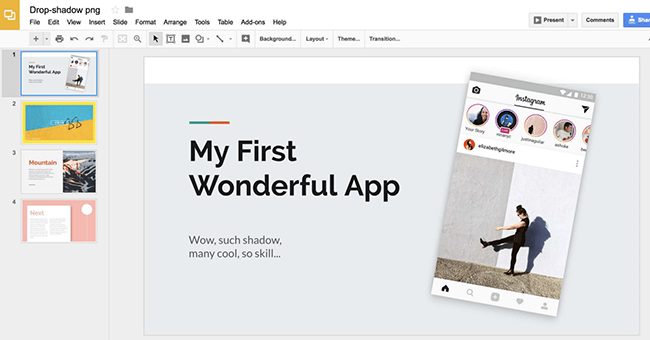 It works much like PowerPoint and other slide presentation websites, but Google Slides is a real champion when it comes to collaborating with your colleagues or like-minded fellows. This time you can really work together on the same project right in your browser and get prompt feedback from your team members. Select a theme for the slideshow, then add standard slide layouts and insert text, graphics, and slide transitions from the menus. This web app truly excels if you need to create a customized project. Canva provides you with lots of stock images, formatted text boxes and page layouts necessary to make an image-focused presentation. If you want to give your presentation a personal touch, upload your own photos, use more than one in any given design and arrange these elements however you wish. With a plethora of font styles, you can still customize them to your liking. Powtoon is a presentation maker empowering you to create animated videos without any technical or design training. 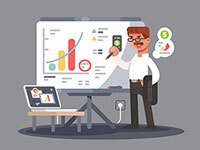 The program offers tons of images and templates to help you make a great presentation with a "modern edge" animation, infographics or cartoonish elements. 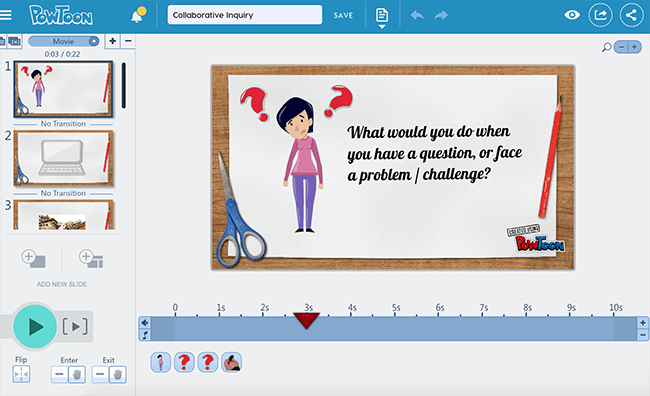 Powtoon is a perfect tool for teaching purposes since it turns a simple click-through presentation into an interactive and yet informative movie. 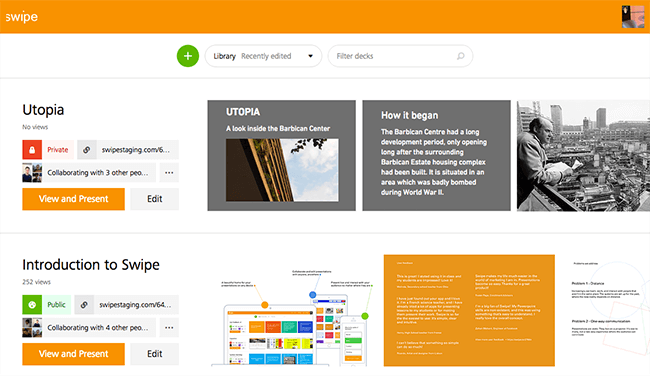 Unlike its more famous cousin PowerPoint, Microsoft Sway focuses on the content of your presentation and showcases the necessary information in a nice organized way. 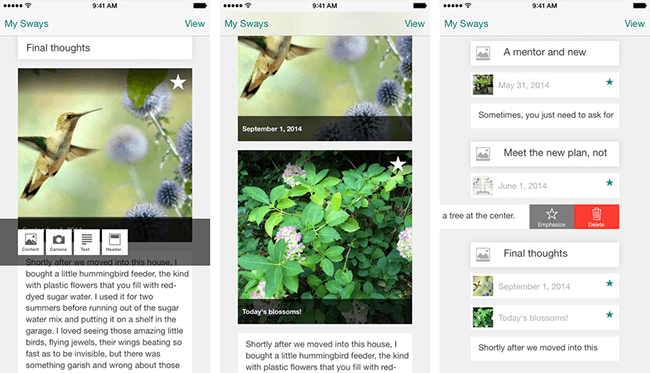 For a start, add your texts, images, links and other data to the Storyline. Then, choose either standard slides or magazine-like scrolling layouts, and pick one of the built-in themes to fit your content into. Microsoft Sway offers an easy solution for those who need to turn a handful of notes and images into a unique presentation isn't forced into individual slides. It’s free slideshow presentation software if you have a Windows Live account. 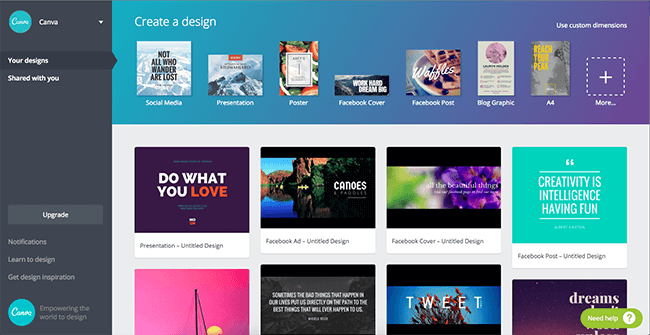 This template-based platform lets users create elegant and professional-looking presentations. 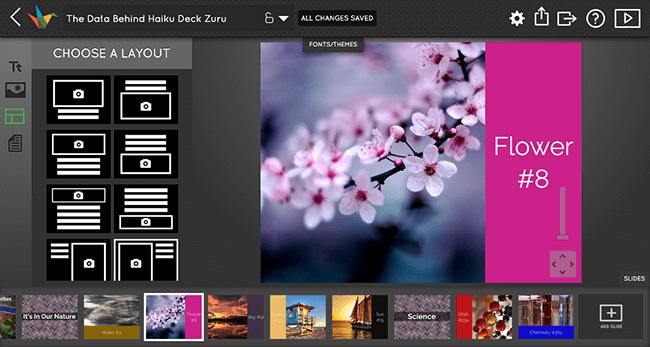 Haiku Deck focuses on key ideas, finds stunning topic-related photographs from a library of 40M+ royalty-free images, and offers thousands of professionally designed templates to choose from. Although this tool is hosted online, you can still download the animated slide presentation you’ve been working on in .pptx format or as video with audio narration. Need to make a slideshow presentation that will certainly engage the audience? Swipe can combine your YouTube videos, PDF reports, images and texts into a single educational unit. What’s more, you can create a poll slide with multiple choice questions to get the viewer’s feedback. If you share a link to your presentation at the beginning, attendees can scroll through PDF files and watch videos as you talk. They can also tap their response in your poll slides, and the answers will show up in real-time on the big screen. 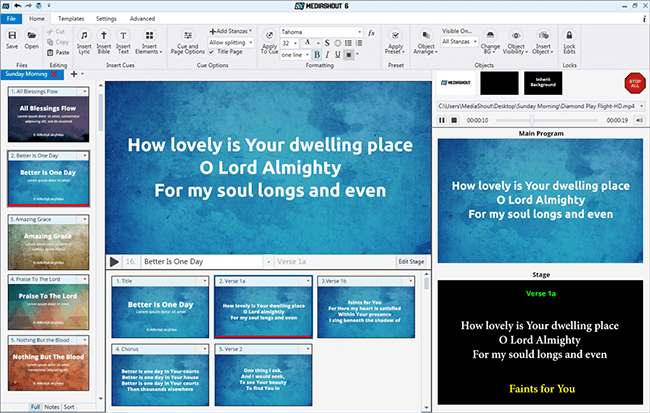 Unlike other slideshow tools in this list, MediaShout is a presentation software tool designed especially for religious institutions and churches of all types and sizes. 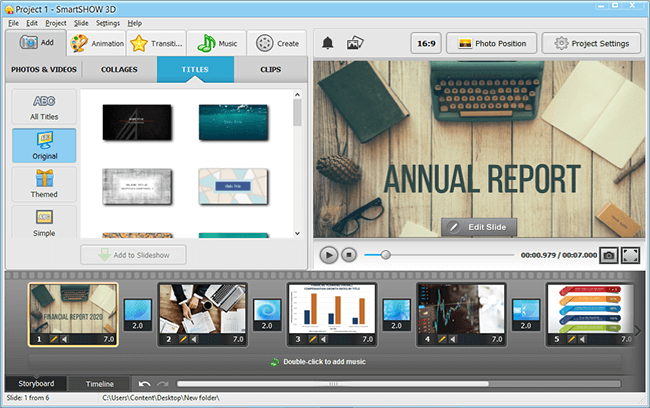 This software is tailored for managing the media and productions during any religious service, particularly during the sermon. While using the program, you’ll get access to 69 Bible versions, database of song lyrics, announcements and tweets management tools. In a nutshell, the programs and online platforms listed above suit different needs and encourage different levels of creativity, but each of them can be a powerful tool in presentation creation. If you’re seeking all-in-one software for showcasing key data and graphics, Haiku Deck or Prezi will be right for you. Do you want to try a more creative approach? Then opt for Powtoon and spice up your narration with stunning animation. Being a church goer, you will definitely like MediaShout and strong focus on religion. In case you want to put together a modern and streamlined presentation or an animated video that can be watched and edited offline, SmartSHOW 3D is your absolute must-have! Many slide presentation programs seem to be OK until you’ve used every single template in their arsenal and run out of other creative options. With SmartSHOW 3D, you will never face such a problem! It gives its digital rivals a run for their money since this software comes with an endless number of slide presentation templates slide presentation templates. There’re special slide packs for professional portfolios, animated photo movies, school activities, and much more. The choice is yours!